I'm in Muncho Lake officially. By days end I'll only be 363.45 miles from Johnson Crossing. The water part is getting close. Last Saturday I was caught in a snowstorm that left a foot of snow all around. Place called Summit Lake about 35 miles from Toad River, BC. Became friendly with Colin Leake the Alaska highway maintenance manager from Summit Lake to the Yukon Border. I've stayed in his barn since last Saturday night. Tomorrow its back to the truck. He has a trailer in Fireside, BC that I'm going to get access to. Fireside is about 60 miles north of Liard hot Springs. Looks like I'll be at Liard this Saturday and Sunday. It's already packed. hundreds of folks. The lodge and three campgrounds are full. Victoria Day is here. Gary Hanson might join me soon. Can't wait. It will be so nice to talk with someone from back home. Ordered a bug jacket for the Lower Yukon. Temps are getting warm and it's hard to sleep with all this light. I miss the cool Skagway nights. Bugs are really getting aggresive. Colin Leake and his family are the classic example of good people. He reminds me of Stan Herpst and Oscar Selmer. Two folks all of us should try to be a little more like. June 7th or close to is still the target date for JC. I know its a 30 ship day but if any one can make it up there I'd love to see ya. Hopefully I'll be able to get online again at Liard. If not there for sure Watson Lake. Which is less than 160 miles away. 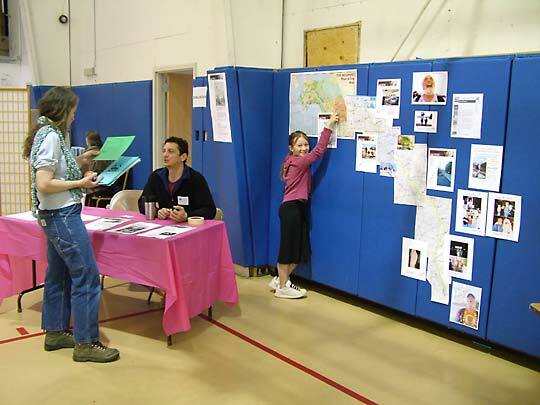 Mike Catsi of the Skagway Development Corp. talks to a visitor to the Heartbeat Trail booth at the Skagway Community Health Fair on April 29. 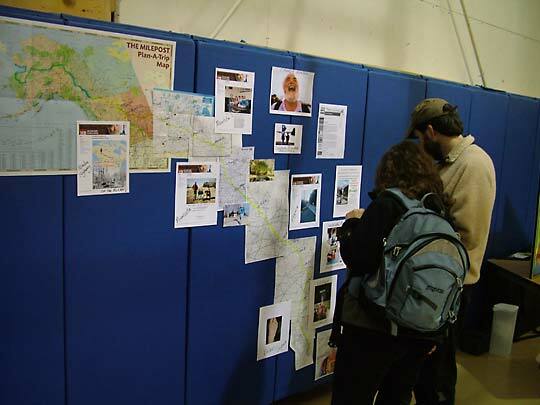 A map of North America detailing Buckwheat's journey across the continent was on the wall behind the booth. Polly Brown points to Buckwheat's location that day at Fort St. John, B.C. 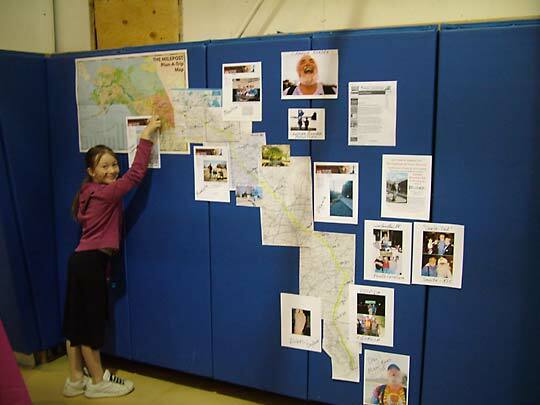 on the Alaska Highway, and Shari Quinn and Billy Strasser check out some of the photos.